Sculpture, particularly stone sculpture, is constantly on my mind. I spend most of my time carving stone and thinking about design, composition, finishes for stone, and techniques I might dream up for a new texture. No matter what I read, or see, or do, stone is on my mind. My art is an amalgam of exterior experiences and interior musings. Everything goes into the mix. These short essays are about artists, ideas, and experiences that influence my stone sculpture. Some are direct influences and some are fun experiences that contribute to my love for and pursuit of artistic expression. Elsie Wood is one of the most all-around creative people I know. She is an elegant abstract stone sculptor and a thought-provoking instructor. 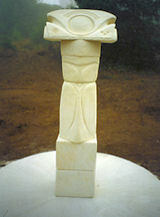 She has participated in many monumental stone sculpture symposia all over the world. Elsie regularly conducts creativity workshops in Colorado. I met her at my first visit to the Colorado Stone Sculptors Society in 2006, and we have been friends and colleagues ever since. Elsie was the first stone sculptor to show me how to see stone. Many times we look at things and don’t critically see what is there. She pointed out aspects of my sculpture that I wasn’t seeing so that I could move forward and finish the sculpture. In particular, the lower half of my sculpture “Spiral Bunny” was not round enough to feel like a soft and full volume. I knew it wasn’t right. I had no experience seeing stone and couldn’t define the problem. Elsie gently and clearly pointed out the lack of roundness in the bunny’s torso. This was an “Ah-Ha!” moment for me and supplied the missing connection. In that moment I learned how to see stone. I was very accustomed to being both creator and critic in my work as a Disney Animator, but suddenly realized that this critical skill directly translated to stone sculpture. From that decisive point I was able to translate nearly all my knowledge of animation to the new medium of stone sculpture. Animation Colleague I first met George Scribner at Disney in 1986. He was the director on “Oliver and Company” and I was an apprentice animator at the time. George is now a fine art painter with Disney and the official artist for the Panama Canal Expansion. He spends a lot of time painting in a . . .
One Great Show! The Fall 2016 show at the Loveland Museum, “A Collector’s Vision” was brilliant! On display were 3 serigraphs by Russian art deco fashion designer and illustrator Erte (accent on the second “e”). His stylized figures, repetitive surface patterns and designed drapery are wonderful to see in person. The movement in his poses . . . Brain Space The finishing process for my sculptures is quite time-consuming, and I have a lot of free brain space to let my thoughts wander. I often wander back to my two graduate years at Cal Arts in the Experimental Animation program. My mentor was Jules Engel, avant-garde animator, filmmaker and painter. Mentor Extraordinaire Jules . . .